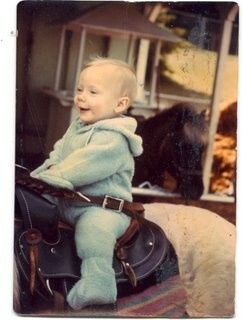 I was a year old, I think this was my first ride, but not my last! I’m not doing NaNo, I can’t. I am enjoying watching my friend Amanda Green work on her challenge, though, and you might be entertained by her character as well. I am, however, trying to keep on with the writing, in the spare moments I have around homework and everything else. Yesterday, for instance, I had an hour of quiet sitting in the study room at the school library, with no pressing homework (they are nice enough not to give us homework right after an exam, usually) so I managed about 800 words, and then doubled that in the evening when I was home. This morning I’ve been staring at the blank post box for the blog for longer than I care to admit, with side-trips to read my usual morning funnies and blogs. I finally read Amanda’s post, and chatted with her a little. She suggested I try posting what I’m working on, telling me it’s making her feel more accountable. So here you are, the as-yet untitled sequel to Farmhand. I’m hoping to have this done by the end of the month (no, not 50K words worth. This is firmly a novella, it hasn’t got enough plot to support more than 20-25K words) and published in time for Christmas. Because it is a Christmas romance story, for my sins. Oh, and if you haven’t seen it yet, here’s the link to Farmhand, my Western love-story, both between two people, and my own love for the part of the country I most identify with. The young woman sitting at the counter in the Bluehills Diner finished writing a short note on the back of a postcard she’d picked up at Lupe’s Everything Shop, and signed it with a simple “C.” She flipped it over to look at the picture on the other side, and picked up her coffee cup with a smile. Her Dad was going to like this one. “A jackalope? Or the postcard?” The young woman looked up with an impish smile. “You’re a college student?” Drema tilted her head a little, looking like she was thinking. Left alone at the counter, the woman turned on the stool and looked out the big plate-glass windows, over the red leatherette booths. This was a real old piece of Americana, and she had been delighted to find it when the snow started an hour or more ago. She hadn’t really had a destination in mind, other than out beyond the city where she would be able to photograph the comet without the lights interfering. If all went well, the comet would swing close enough to the earth to trigger an aurora, which would be a great bonus for her photos. The snow was at the picture-perfect stage, speaking of photos. Fat, fluffy flakes drifted lazily down from the sky, covering the world outside in a blanket of white. Perfect. Not. She needed to drive in this, still, and that was looking like a tricky proposition. She heard Drema coming through the swinging door, and turned back to face her. From the smile on the older woman’s face, the conversation about a place to stay had gone well. Feeling as though she’d stepped into a whirlwind, the woman at the counter wordlessly took the map, wondering what she’d gotten herself into. Pie in hand, the newcomer stepped out onto the small porch, and took a deep breath of frosty air. At least it wasn’t dark. The drive wasn’t too bad. The roads, like most in this area of the state, were straight. She only had one turn before she got to the very long driveway that led her toward the Macquire place… at least, she hoped that’s what it was, and not some stranger who’d meet her at the door with a shotgun. People around here weren’t unfriendly, they were just cautious. The snow had fallen off, a lull in the storm, she guessed, as the clouds had gotten, if anything, lower and darker. She parked next to the old woody station wagon with a sigh of relief. In the growing darkness, she could see a big house to her left, windows warm with light, a barn in front of her, and a smaller, dark building in between them. Someone opened the farmhouse door, throwing a long rectangle of yellow light out onto the snow, and she got out of the car. Balancing the pie, she made her way to the porch. She sat at the kitchen table, which was a lovely piece, thick slabs of wood oiled and polished to a glowing finish. There were six chairs around it, and she wondered how big the family was. “Thank you.” She murmured as he set a mug down in front of her. “How many kids do you have?” She asked, sipping at the coffee. It wasn’t as strong as she’d been afraid it would be. “Candy?” His forehead wrinkled a little, and she felt herself wince. Tags: Amanda Green, Bluehills, Cande Cain, Christmas Story, western romance. Bookmark the permalink.